Somehow, we finally managed to make it to the end of 2016. Whether you had your best year ever or didn’t quite get to all the things you wanted to accomplish, rest assured that the winds of change will blow a whole new set of challenges and opportunities your way in 2017. What are some of the changes content marketers are likely to encounter over the next 12 months and beyond? We asked a group of experts to set the stage for our expectations and prepare us for what’s to come. They share their views in our ninth annual e-book of content marketing predictions. 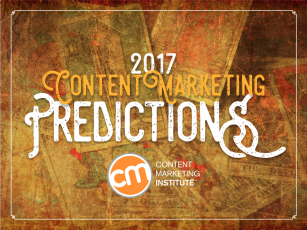 In this year’s edition, 60+ Predictions on Content Marketing in 2017, you’ll see predictions on which formats and channels will dominate the landscape, how increasing content volume might impact amplification techniques, which technologies are poised to revolutionize how your content engines function, and more. Brands’ acquisitions of media sites, blogger sites, and other influencer sites will expand from “here-and-there” isolated occurrences to a full-blown trend “on steroids.” In 2017, we will see a number of large and medium-sized companies actively purchase media brands ripe with subscribers and content rather than building the platforms themselves. In the wake of the election, paid subscriptions will substantially grow at traditional news companies. This will open up the opportunity for brands to start charging for their own content as more of them start to drive direct revenue from their content in the form of subscriptions, training, and events. Custom print magazines have finally hit the bottom as a content marketing tool, so more brands will launch print magazines in 2017 as a way to cut through the clutter – a critical goal that has been proving increasingly difficult to do online. Curious about past predictions? Check out our forecasts for 2009, 2010, 2011, 2012, 2013, 2014, 2015 and 2016. Want to see how these predictions unfold in 2017? Subscribe to CMI’s free daily newsletter.